Joints are formed by two or more bones, where their articulating ends are lined by a protective cushion called cartilage. The non-articular portion of the joints is covered by synovial membrane. The synovial fluid fills the synovial cavity, which acts as a lubricant for the joint. The cartilage does not have its own blood or nerve supplies; as long as the cartilage is intact, there wouldn’t be pain during movement. Arthritis means inflammation of the joints, where the joints become hot, painful, swollen and difficult to move. In case of arthritis, the cartilages are gradually worn out, exposing the ends of the bones. When the bones, having nerve supplies are rubbing one another during movement, it becomes very painful and can badly affect the mobility and activity of the pet animals. Rheumatoid arthritis: It is primarily due to abnormal immune reaction. Septic arthritis: It is caused by micro organisms such as bacteria, viruses and fungi. Osteoarthritis/Degenerative joint disease: It occurs when the cartilage is damaged either by wear and tear as the animal ages, or as a result of trauma, infection or surgery. The damaged cells of the cartilage release substances which result in inflammation, pain and further damage to the cartilage. Osteoarthritis is the most common form of arthritis. Old age: In old age, the body utilizes the cartilage forming substances faster than it can produce. The cartilage will be more susceptible to damage. However arthritis can also be seen in young dogs. Hip and elbow dysplasia: Hip and elbow joints are the two most active and weight bearing joints. The more the activity of the joint, the higher is the chance of damage to cartilage. Improper nutrition: An imbalanced diet can also increase the occurrence of osteoarthritis. Obesity: Dogs who are overweight have more chances to suffer osteoarthritis due to the increased strain and pressure on the joints. These dogs may develop arthritis at a younger age. Injuries: Injury to the cartilage can weaken the joint and make it more prone to Osteoarthritis. Smooth and slippery floor where the pets frequently overstretch their limbs, activities like strenuous exercise, constant jumping or other physical exertion also contribute to cartilage damage. Which breeds of dog are commonly affected by Osteoarthritis? Bones are the main lever for bearing the body weight. 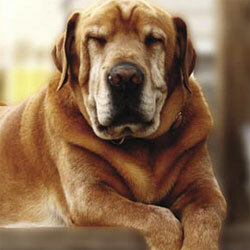 Osteoarthritis is commonly found in large and giant breeds of dogs, where the joints bear more tension. The breeds of dog commonly affected are Great Danes, Rottweilers, German Shepherds, Mastiff, New Foundland, St. Bernard’s, Labrador and Golden Retrievers. veterinarian will go through your pet’s medical history and conduct a physical examination. He/she will want to know about your pet’s lifestyle as well as the symptoms and behaviours you have observed at home. In the early stages of arthritis, the dog’s joints will be swollen and sore, and the veterinarian will be able to detect this through physical examination. If arthritis has occurred since long time, x-rays can be very helpful with identifying the arthritis and assessing the degree of joint damage. Other diagnostic methods like blood tests and joint fluid analysis can be used to diagnose certain types of arthritis. Complete recovery or cure is not possible in case of osteoarthritis, but managing it to improve the quality of pet’s life is possible. The faster osteoarthritis is first diagnosed and treated, the better your pet’s quality of life will be. The choice of treatment often depends on the cause of arthritis and the severity of the disease. NSAIDs: NSAIDs can reduce the inflammation within a short period of time. But, as osteoarthritis requires long term management, some dogs may be sensitive to their side affects such as lack of appetite, vomiting and diarrhoea. Corticosteroids: Corticosteroids can show a drastic improvement in some cases of osteoarthritis. However, long term use may reduce wound healing and may cause other adverse effects. Antibiotics: Septic arthritis are preferred to treat with Antibiotics for a month under the veterinarians’ recommendation. Nutraceuticals: Nutraceuticals can help prevent further breakdown of the cartilage and support the joint. As these products are natural, they have no side effects and can be used alongside prescribed medication. Their onset of action may take longer time; it is very essential for the pet owner to follow their veterinarian’s suggestion. Supplementation can be started at any stage in life, but is most effective if started at or just as the signs of arthritis begin to show. It is beneficial to supplement working dogs and overweight dogs from a young age as their joints are placed under additional strain. Research has shown that in many cases Nutraceuticals are highly effective in management of joint diseases. Osteoarthritis may progress very slowly (over years) or very quickly (in a few weeks or months); depending on your pet’s age, activity level, the joints involved and the underlying causes. A simple regimen of weight control, moderate, regular exercise, nutraceuticals and occasional use of anti-inflammatory drugs may be sufficient to manage to relieve the pain. What are the common compounds used in joint support Nutraceuticals? Glucosamine: This is the most common ingredient found in joint supplements. It can be available in Glucosamine Hydrochloride and Glucosamine Sulfate, where Glucosamine Hydrochloride is more preferred as it is smaller and more readily absorbed into the cartilage. Glucosamine may help to prevent cartilage degeneration and help repair some of the damage by promoting the synthesis of cartilage and synovial fluid. Chondroitin: Chondroitin Sulfate is a natural component of cartilage. It provides building blocks for the synthesis of glycosaminoglycans (cartilage building blocks). It provides resistance of cartilage to compression helps cartilage repair and improves the quality. Herbal extracts: There are various scientific reports of using herbal extracts for managing osteoarthritis. Among these, extracts of Boswellia serrata and Withania somniferra are the two potent anti-inflammatory agents, which are effective for reducing the arthritic pain and swelling, and at the same time have very low risk of side effects. Other commonly used compounds in joint support nutraceuticals include Methyl Sulphonyl Methane (MSM), Green Lipped Mussel, and Essential fatty acid Omega 3, Manganese and Vitamins E and C which are effective in cartilage formation, repair and reducing cartilage damage. In any case, your veterinarian can determine the best course of treatment. There is no reason why, with your faithful attention and loving care, as well as your veterinarian’s guidance, your osteoarthritic pet cannot have a comfortable life. Diamonds are a dog’s best friend! !